Congratulations to the E&R race team for winning the NSCA Super Modified Class race by beating the class champion and record holder. 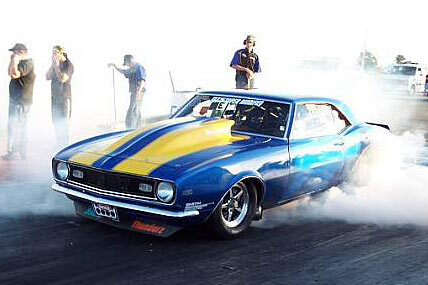 The E&R Camaro remains a very classic and competitive 10” tire car that has stayed true to the original spirit of 10” tire racing by continuing to race with a single 4 barrel carburetor and a nitrous engine that is under 500 cid. The best performance to date is a 7.3 second ET at 2850 lbs. A new and more powerful Rolling Thunderz engine equipped 68 Camaro is ready to race the Super Street Class in 2009 with a single 4 barrel carburetor and a cowl hood. Performance is expected to be in the 6 second range in a quarter mile drag race. Emidio Catalano doing a high powered burn out in the Rolling Thunderz powered 1968 Camaro.